Often medieval manuscripts, especially those of theological or historical treatises, contain more than one work. This 12th-century manuscript has copies of works by the early medieval authors, Isidore of Seville and Alcuin, on the subjects of goodness and wisdom, along with verses on the eucharist, faith and the Fall. Such a collection would have been read by the medieval monks of Haughmond Abbey as part of their daily program of prayer, contemplation and study of scripture. An inscription at the top of the first page identifies the manuscript's medieval owners: 'This is a book of the Church of St John the Apostle and Evangelist of Haughmond.' 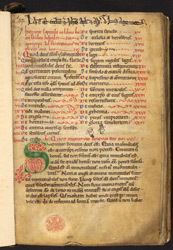 The page presents the 'table of contents' or chapter lists in red for Isidore of Seville's 'On the Highest Good.' The bishop of Seville, Isidore (560-636), wrote numerous important treatises, such as 'Etymologies', many of them influencing early Anglo-Saxon and Irish writers, such as Bede. In the title of the book on this page (in large red letters), Isidore states that it is for Florentina, his sister who was a powerful nun in charge of numerous convents.